Our tips for driving your hire car in the snow and ice. Driving in the snow can be stressful, but it really doesn't have to be. There always seems to be tonnes of things to remember and keep in mind, so, to help you, we've put together our top tips for driving your hire car in the snow and keeping safe behind the wheel. What's scarier than the post-Christmas bank balance? Snow chains! When do you need them, how do you put them on, how do you get them off again? Granted, snow chains can be quite confusing, but they don't have to be. 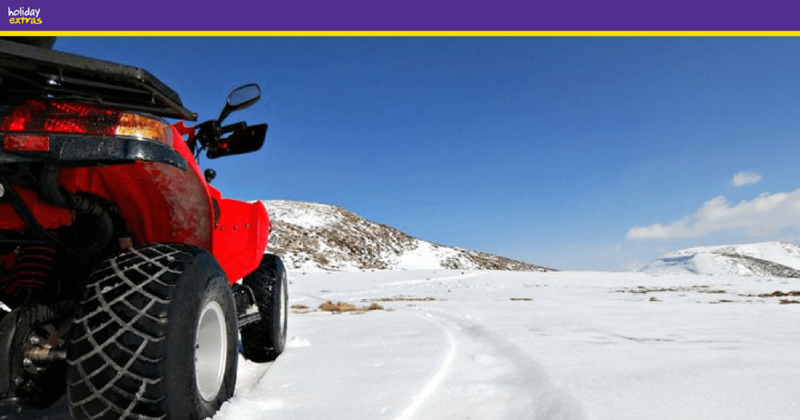 Snow chains are great for giving you extra traction on very icy or snowy surfaces and are perfect for driving around ski resorts or mountainous areas. They're much easier to fit than you think and give you peace of mind and confidence when driving. Snow chains can be fiddly to fit, so we advise having a practice before setting out on your journey. With your handbrake on and your car in gear, hold the chain over your tyre and lower over the wheel evenly, covering what you can. Repeat for the other tyre. Drive forward to expose the rest of the tyre. With your handbrake on and car in gear, secure the rest of the chain. If your snow chains have rings, secure these to the wheel. Once fitted, drive forward a few feet and re-tighten the chains. As soon as the snow and ice clears and you're back on clear road, remove the chains by unhooking them from inside the wheel. Only use the chains on treacherous roads, as using them uneccessarily can cause damage to both the road and your wheels. ❆ Water - preferably unfrozen! ❆ Something to keep the small ones amused. If you're travelling with children, it's always a good idea to take something to entertain them in case you get stuck in traffic. And that's that! Driving in the snow is all about taking it slow and being extra cautious. It can be enjoyable and opens up lots of opportunity when travelling in ski resorts or colder climates. If you're looking to book car hire for your next trip, contact us.